This guide is designed to help you navigate and optimize Revel's Product Forecasting / Item Tracking report features. This feature is particularly relevant for Quick Service users who have items that need to be prepared throughout the day. This feature allows users to plan for how many of those items to have prepared and ready before the customer orders, rather than having to produce items as a customer orders. 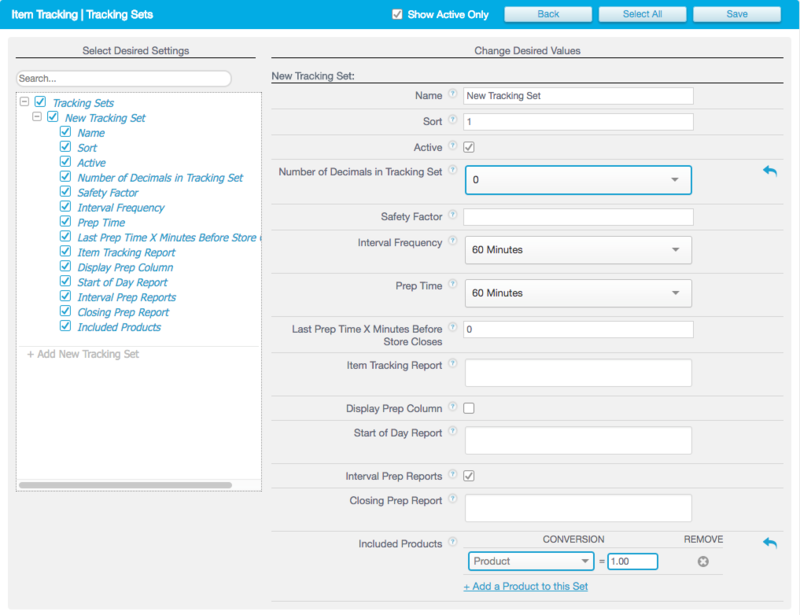 Tracking Set - The set of products that the report will track for sales and product quantity. Time Slot / Interval - For items that are tracked and/or prepped throughout the day, this defines how often the item is tracked. 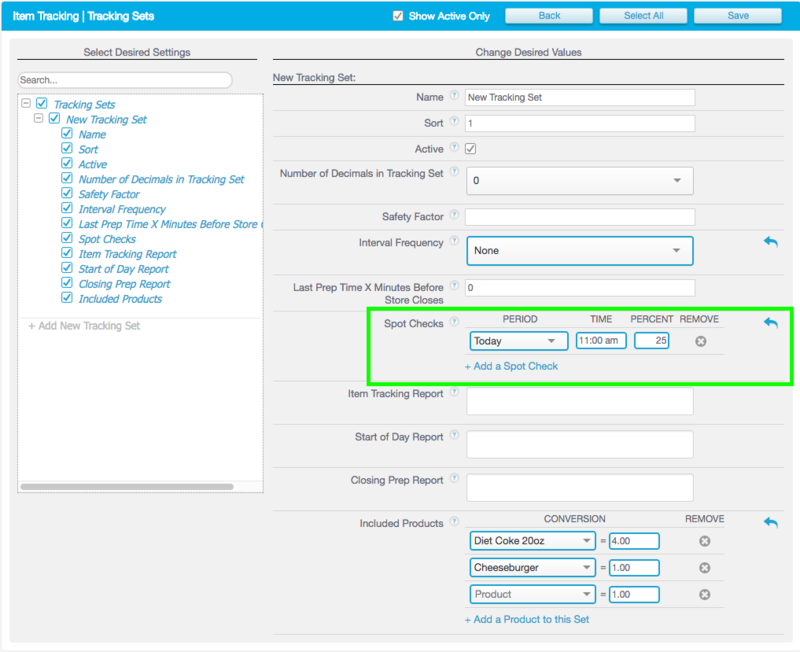 To enable the Item Tracking Report on the Management Console, navigate to the Settings / Reports / Product Forecasting page. You can also search for "Product Forecasting" in the search bar to display only those settings, once on the Settings page. Click the checkbox for the "Enable Item Tracking" option. This will enable the Item Tracking Report and allow you to configure item tracking sets. Use the settings on this page to specify whether the sales forecasts made by the report will be based off of Net or Gross sales, and specify the number of weeks to base your forecasting for both item quantities and sales. Use this page to configure your item prep reports and which printers to print those reports from. These are reports that you can configure to print out at various points in the day, indicating how many items will need to be prepped for the following day. The image below shows the Settings / Reports / Product Forecasting settings. Enable Item Tracking Enables the Item Tracking Report on the Management Console. Forecast Item Quantities Based on Number of Weeks Specifies the number of weeks off which to base the forecast prep amounts for each interval. Forecast Sales Based on Number of Weeks Specifies the number of weeks off which to base the total forecasted sales for the day. Base Sales Forecasts off of Specifies whether to base sales forecasting off of Net or Gross sales. Print Report To Specifies the printer which will print the Item Tracking reports. Prints X Minutes before business opens - Input the number of minutes prior to business open that the Start of Day Report should print. Note, to use this feature, you must input your business’ time table (Note, this can take a negative value if you want the report to print after the business opens). 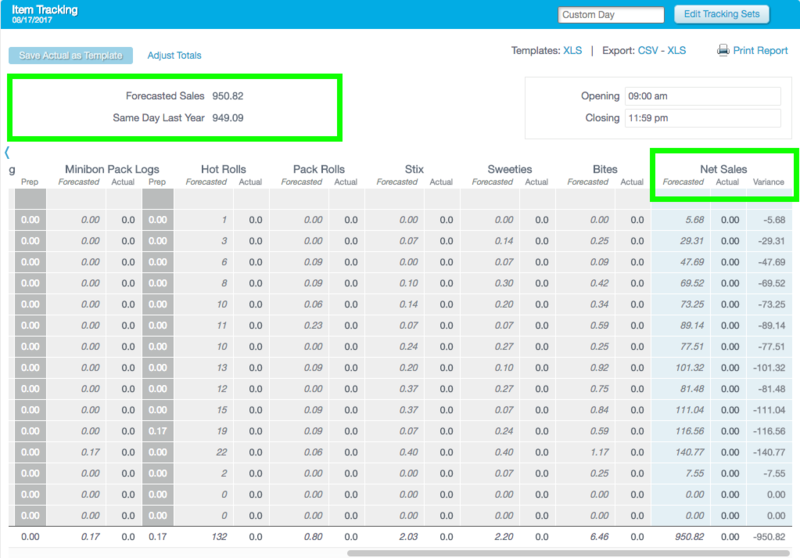 Include Totals For Each Time Slot - Includes forecast totals for each interval time slot in the report. Include Interval Totals for the Day - Includes the daily totals for each interval tracking set in the report. Hourly Forecasting Sales - Includes the forecast hourly sales for the day. Interval Prep Report Interval Prep Reports print all non-daily tracking sets. This option contains five sub settings. Print How Often - Specifies how often the reports print. Users can choose the following values: Never, 15 minutes, 30 minutes, one hour, two hours, and four hours. Include Prior Hour Totals - Includes a total on the report showing how much was sold last hour. Include Cumulative Totals - Includes the total amount that have been sold throughout the day. Include Next Time Slot Forecast - Includes the totals for the next time slot that will print out. Hourly Sales - Includes the hourly sales for the day. Closing Prep Report Closing Prep Report prints a summary of what will need to be prepared for the next day. Navigate to the Establishment tab. Navigate to the Reports > Other Reports > Item Tracking Report page. Click the Edit Tracking Sets button at the top right of the page. 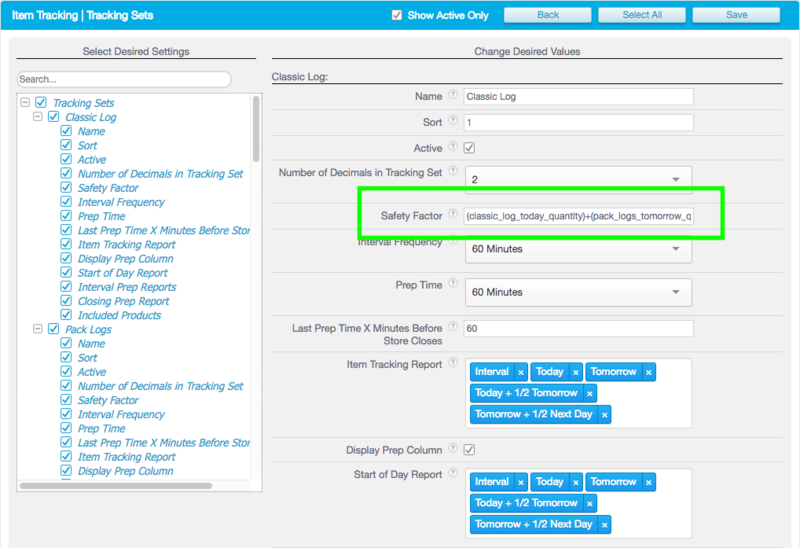 Click the + Add New Tracking Set button to expose the Item Track Set settings. Configure the settings as desired. The image below displays the page. Name Specifies the name of the tracking set. User defined string. Sort Specifies the sort order of the tracking set. That is, the order the set appears on the Item Tracking Report. Numerical value based on the number of configured tracking sets. Active Specifies if the set is currently active. Only active sets are visible in reports. Checked or Unchecked. Safety Factor Specifies the percentage by which forecast amounts for this set should be increased in order to guarantee that there is sufficient product produced. You may also input a simple formula to calculate the safety factor based on preset variables. Please see the Safety Factors section for formula building instructions. Percentage safety factors will apply to all tracking frequencies. Formulae will apply only to interval tracking frequencies. Numerical Percentage. Spot Check This setting is only displayed if the "Interval Frequency" field has been set to "None". Spot checks help confirm that you are producing enough of the item throughout the day. Input the interval you want to check for, the time the spot check should print and the amount of the interval's quantity that you should have produced by that time. You may input multiple spot checks, say 25% at 11:00, 50% at 2:00 and 75% at 5:00. Item Tracking Report Specifies how the tracking set will be displayed on the Item Tracking Report. Interval sets will be displayed in the table at the top of the report. Daily sets will be displayed at the bottom of the report. You may pick up more than one frequency. Interval - This causes the item to appear in the upper section with Time Slot forecasts. Assuming the Prep Time field is not "No Prep Time", there will be a Prep Column. This is only available if the item’s Interval Frequency is not "None". Start of Day Report Specifies the frequencies by which forecasts for this set will print on the start of day report. You may pick up more than one frequency. For example: if a tracking set has a Frequency of 60 minutes, the 10:00AM hour Prep field will display the quantities needed in the 11:00AM hour field. Interval - This causes the item to appear in the upper "Hourly" All Day Section. This is only available if the Tracking Set's Interval Frequency is not "None". Closing Prep Report If you want the forecast quantities for tomorrow or tomorrow + 1/2 next to print on the closing report, configure them here. Tomorrow - Include the item in the Tomorrow Section. This assumes that the item is in the Tomorrow section of the Item Forecasting report. If it isn’t, the system will use the value from the next day’s Item Forecast Report. Tomorrow + ½ Next Day - Include the item in the TMRW + ½ Next Day section. Like above, this assumes that the item is in the Tomorrow +1/2 Next Day section of the Item Forecasting report. If it isn’t, the system will use the data from the following two day’s Item Forecast Report’s to generate the forecast. Included Products Specifies which products to include in the tracking set. For each product, enter how many individual units to track. For example: if you sell cookies and track them by sheets of 12, you would enter 12 here. Configured product and numerical conversion rate. The report also has item forecasting preparation chits to be sent to kitchen printers. Three different type of chits can be sent to kitchen printers, all with customizable options. The settings that control this functionality can be found on the Settings > Reports page under the Product Forecasting section or the Reports / Product Forecasting section of the settings page. The image below highlights the printing settings when configuring item tracking sets. For more detailed descriptions on the settings, please see the Item Tracking Set Settings table. Because Forecasting is not a hard science, Revel has developed the Safety Factor feature to ensure over-production into the forecasts, so that users won’t run out of key items. This percentage varies by tracking set. 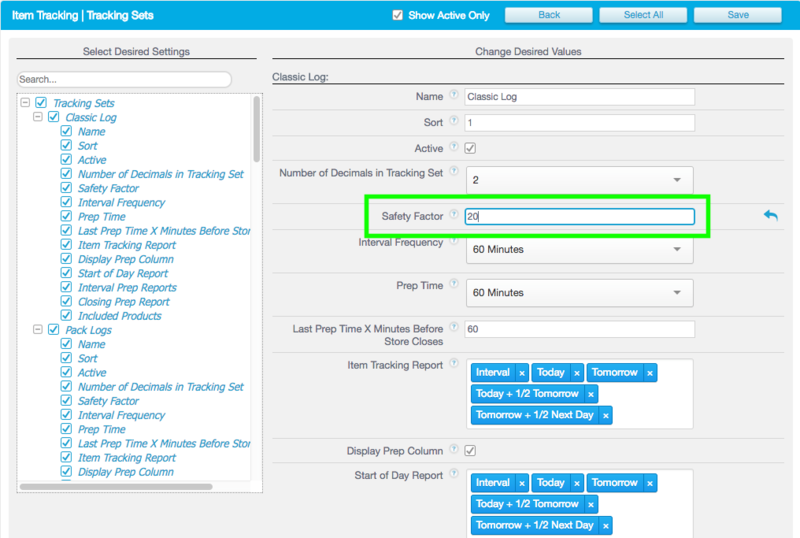 Configure Safety Factors using the corresponding field on the Reports > Item Tracking > Edit Tracking Sets > Details page. This field specifies the percentage by which forecasted amounts for the item set should be increased in order to guarantee that there is sufficient product. Users may also input a simple formula to calculate the safety factor based on preset variables. In other words, if you forecast that you will sell 16 cookies, and the safety factory is 20%, than they system changes the forecasted cookies to 20. You can also configure safety factors by equation building. Equation building uses variables and simple math to increase production based off future forecast sales or item quantities. For example: Say you have a tracking set that estimates rolls needed for tomorrow. You prep rolls a day in advance, throughout the day. You can build an equation that takes tomorrows roll forecast (110 in this example), divides it by work hours in the day (11), and subtracts an integer (the amount you are already over-producing, 5 in this example). The resulting "6" (110/11-5) will be added to the toll forecast for each hour. Any mathematical equation can be entered into the Safety Factor field using one or more of the following predefined variables. Use the "*" symbol for multiplication. For the "SETNAME" variables, you can find the tracking set SETNAME by hovering your cursor over the tracking set name on the Item Tracking Report, as shown in the image below. The following images displays a formula entered in the Safety Factor field. You can find the actual safety factor amount, meaning the amount that the equation produced, by hovering over the forecasted column for the tracking set. In order to help track the production of long frequency items, Revel has added the ability to print Spot Checks for Item Sets tracked by longer frequencies. Spot Checks help confirm that the user is producing enough of the item throughout the day. These will be printed on the Interval Prep Report printouts. When configuring a Spot Check, input the interval to check for, the time the spot check should print and the amount of the interval's value that has been produced up to that time. Users may input multiple spot checks. The Item Tracking Report is the summary of the day's activity for item production and preparation. It can be customized and managed, allowing you to optimize your production and reduce inventory waste. On the Item Tracking Report, the "Forecasted" column will display the forecasted sales x minutes (where x minutes = prep time) before the actual sales. If the prep time is one hour, and the forecasted sales amount for 10:00 AM is 10, the 9:00 AM prep cell will display 10. The "Prep" column will also leverage 'time last item can be produced'. If sales run to 10:00 PM, but the time the last item can be produced is 8:00 PM, then the values for both 8:00 PM and 9:00 PM will be put into the 8:00 PM prep cell. For example, a one hour prep time. 1 Save Actual as Template - Copies the actuals from a day into the forecast columns and saves them as a template. 2 Adjust Totals - Allows you to adjust the overall percentage for projected sales/net sales; entering a number into the field will adjust all values associated with it. 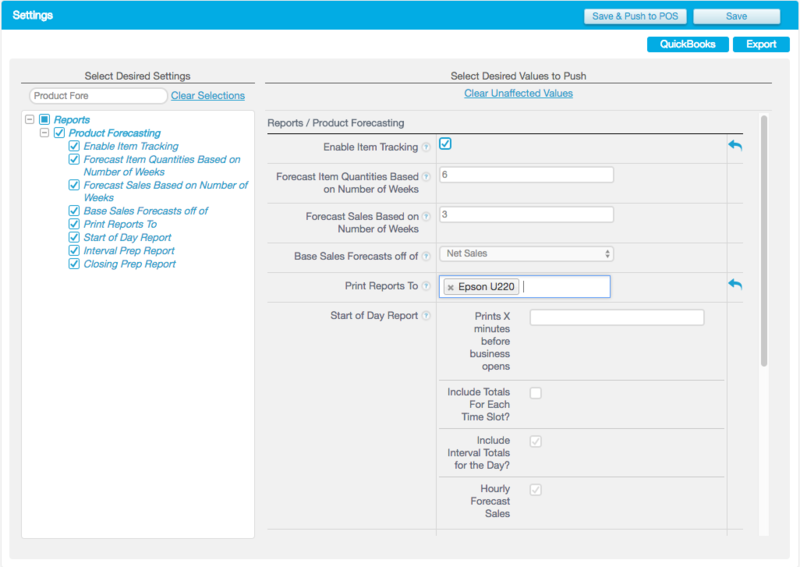 3 Custom Day - Displays the product forecasting data for a specific day. Clicking the field will expose the date picker widget. 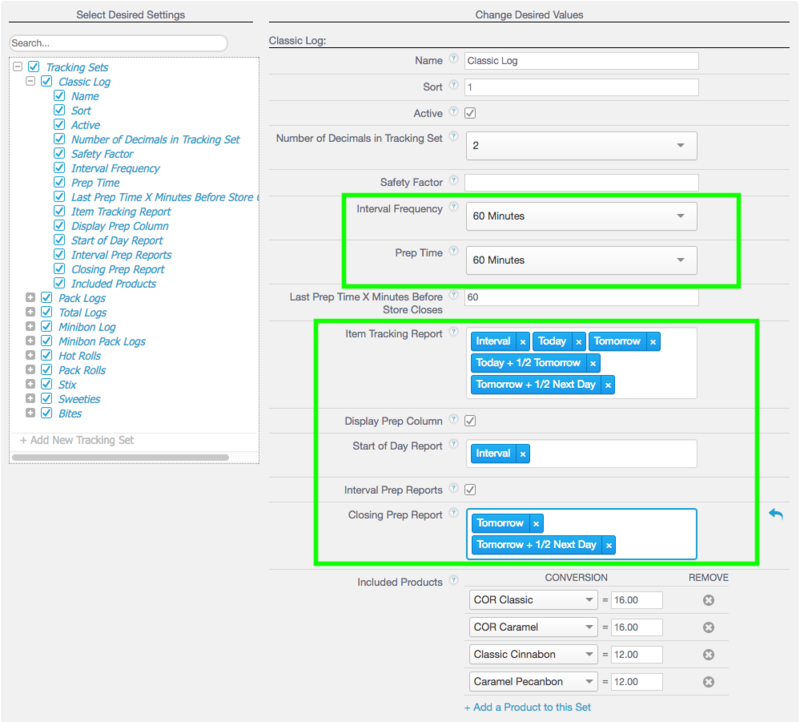 4 Edit Tracking Sets - Takes the user to the Item Tracking > Tracking Sets page. Users can configure and edit tracking set settings on this page. For more information, see the Configure Tracking Sets section. 5 Import / Export Template - Allows for the export and import of tracking sets in Excel format. The "Template: XLS" option at the top right of the Reports > Item Tracking Reports page brings users to the Reports > Item Tracking > Import page. The page consists of two windows: "Item Tracking: Prepare For Import" and "Item Tracking: Import". The "Prepare For Import" window allows users to export and empty template, so that they can populate it with their own data and re-import, or export a previously saved template. The "Import" window allows users to import a new template, or update an existing one. 6 Print Report - Prints the report in PDF form. Forecasted Sales - The average Net Sales for the day based on "Forecast Net Sales Based on Number of Weeks" value. Same Day Last Year - Is the Net Sales from this date 52 weeks ago. Opening - Specifies the time the report will start tracking product data. Closing - Specifies the time the report will end tracking product data. 9 Time Slot Row - These display the time slots, as defined by the Interval Frequency setting, as the day progresses. Each time slot will have a Forecasted, Actual, and Prep column for each tracking set. The Net Sales column will have a Variance column instead of the Prep column. 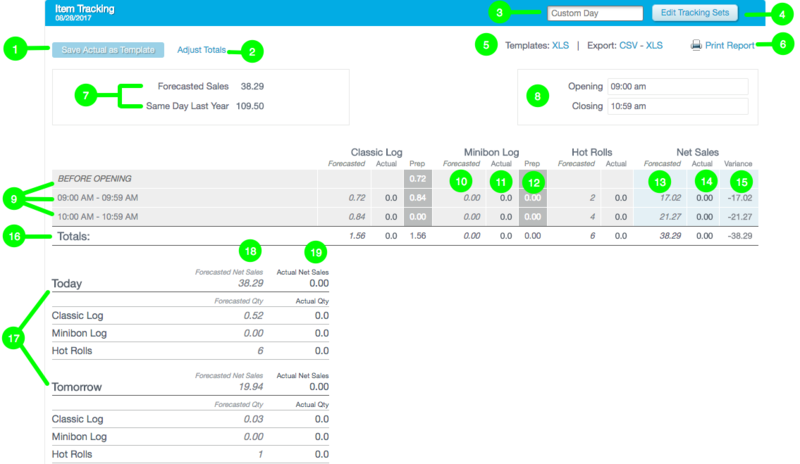 10 Tracking Set Forecasted Column - Indicates the forecasted sales for the tracking set for each time slot. 11 Tracking Set Actual Column - Indicates the actual sales for the tracking set for each time slot. 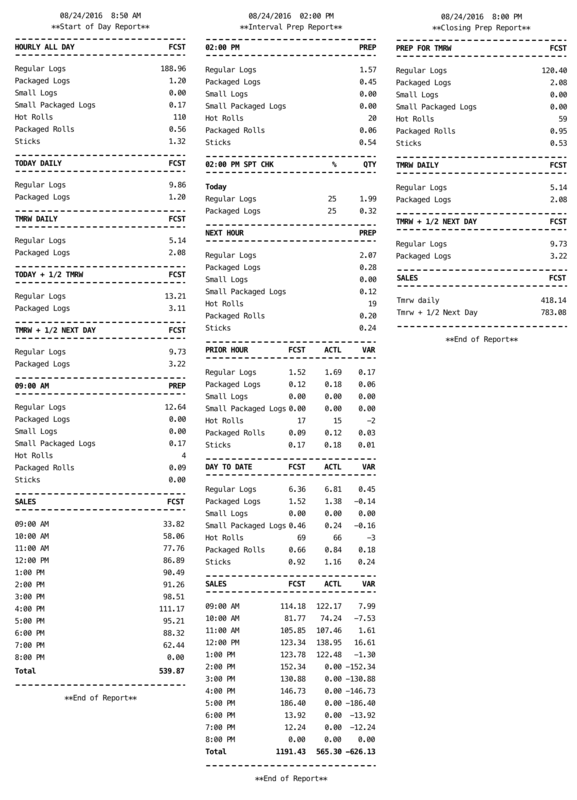 12 Tracking Set Prep Column - Indicates the amount of product that needs to be prepared before the next time slot. 13 Net Sales Forecasted Column - Indicates the forecasted sales for all tracking sets for each time slot. 14 Net Sales Actual Column - Indicates the actual sales for all tracking sets for each time slot. 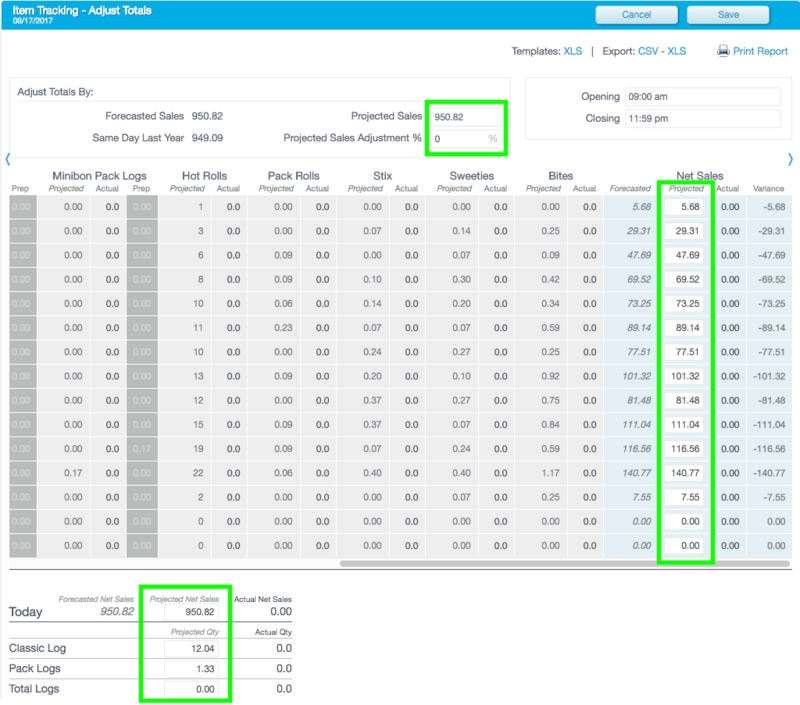 15 Net Sales Variance Column - Indicates the difference between the forecasted sales and actual sales for all tracking sets for each time slot. 16 Totals - Total values for each column. These values will updated as time slots progress throughout the day. 17 Next Day Projections - Gives sales projections for each tracking set for the defined interval periods. See the Totals and Additional Long Term Forecasting Frequencies section for more information. 18 Forecasted Net Sales - The forecasted net sales for the tracking set, for the interval period. 19 Actual Net Sales - The actual net sales for the tracking set, for the interval period. 20 Forecasted Qty - Indicates how much of the tracking set will need to be produced for the interval period. The "Opening" and "Closing" field in the upper right portion of the Item Tracking report allows users to account for unusual hours, such as irregular hours, excess hours, or missing hours, which may have never been entered into the Item Tracking timetable. On the Item Tracking Report, the Net Sales column displays Net Sales by hour using the number of weeks input in the "Net Sales based on Number of Weeks" field on the Settings / Reports / Product Forecasting page. The "Variance" column has been added to the Net Sales column on the report, and shows the difference in the forecasted and actual net sales by hour, as highlighted in the image below. Projected Sales - Initially this field is filled in with Projected Forecast Sales. It is editable. If edited, the "Projected Sales Adjustment %" field below it shall become a value other than 0%. Projected Sales Adjustment % - The Percentage difference between Forecast Sales and Projected Sales. It is editable. If edited, the Projected Sales, and the Projected Sales column will also adjust accordingly. Please note that this is a total change. If the user increases everything by 10% and saves the changes, and then changes this number to 20%, they then end up with 20%, not 30%. Projected - This column appears in the Net Sales Columns, after the "Forecast" column. This column is the Projected Sales and is calculated by the Forecast Sales increased or decreased by the "Projected Sales Adjustment %". These values are editable. If edited, the "Projected Sales" number at the top shall update accordingly. That number, along with the "Projected Sales Adjustment %" will become uneditable. In Edit Mode, in the Tracking Sets column section, the "Forecast" column shall become the "Projected" column. It shall be the former "Forecast "value for the hour increased or decreased by the percentage difference between Forecast and Projected Sales for the hour. It shall NOT be editable. Similar changes will happen to the fields on "Items to Make All Day" at the bottom of the page. Once the user clicks save, if they have adjusted the page in any way, Forecast Quantity and Forecast Sales will rename themselves Projected. Also, any adjusted values will appear in bold after clicking "Save"
Description - Represents an item that is forecasted to be needed Today. The Today Forecast Section includes Today’s "Net Forecast Sales" and "Actual Net Sales". Editing - If the page is edited, then the Forecast Sales changes to Projected sales and the values will adjust by the appropriate percentage difference between Forecast and Projected Net Sales. Editing - Editing Today’s page doesn’t change Tomorrow’s "Net Sales Forecast". Instead, if a user edits tomorrow’s Net Sales Forecast, it will reflect back on today, and alter "Forecast Sales" to "Projected Sales" and update values accordingly. Description - Today + ½ Tomorrow specifies the amount of an item needed for today and partially into tomorrow. The Today+ 1/2 Tomorrow’s Forecast Section includes "Net Forecast Sales" for Today and the first ½ of the Tomorrow (the system knows how long the opening day is tomorrow, finds the mid-point of the day and uses the sales up to that mid-point) and the "Actual Net Sales" for the same time period (only on a historical basis). Similar to Tomorrow, Today+ 1/2 Tomorrow, reflects the "Projected Net Sales" of Tomorrow (assuming they exist). Editing - If a user edits Today’s Net Sales, those edits will be added to the numbers from the first half of tomorrow, and the values updated proportionally. Description - Tomorrow + ½ Next Day represents the amount of an item needed for tomorrow and partially into the following day. The same item may be in both Today and Tomorrow tracking frequencies. The Tomorrow + ½ Next Day’s Forecast Section will include "Net Forecast Sales" for Tomorrow and the first ½ of the following (the system knows how long the store is open that following day, finds the mid-point and use the sales up to that mid-point) and the "Actual Net Sales" for the same time period (only on a historical basis). Editing - Like Tomorrow and Today +1/2 Tomorrow, this forecasting frequency acknowledges changes to Net Sales made on future dates. In fact, editing Today’s net sales has no impact on this tracking set. The image below displays the daily forecasting frequencies as they appear in the Totals section on the Item Tracking Report page.